Van Rensselaerstraat 35 III- IV Amsterdam - Ramon Mossel Makelaardij o.g. 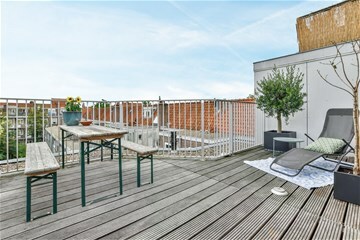 B.V.
Tastefully renovated and remarkably light and airy double apartment with south-facing roof terrace and ample opportunities for extension. The apartment currently has a surface area of 88 m2 but permission has been granted to expand the fourth floor and place a large roof terrace on the fifth floor. This could add 19 m2 of living space, creating a large 107 m2 apartment with two additional bedrooms and a spacious roof terrace. 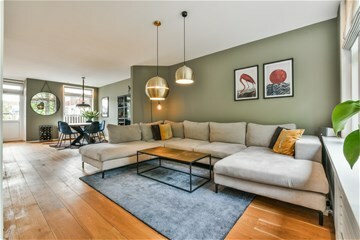 The apartment was renovated to a high standard in 2016-2018. This included the fitting of a new bathroom, complete rewiring, the installation of recessed spotlights and light sensors and attractive radiator coverings. The bedrooms were also fitted with bespoke built-in wardrobes, making optimum use of space. Finally, the apartment was beautifully plastered and all paintwork was renewed in 2018. All in all, a perfectly maintained house that is ready to move into, but also offers plenty of opportunities for extension. 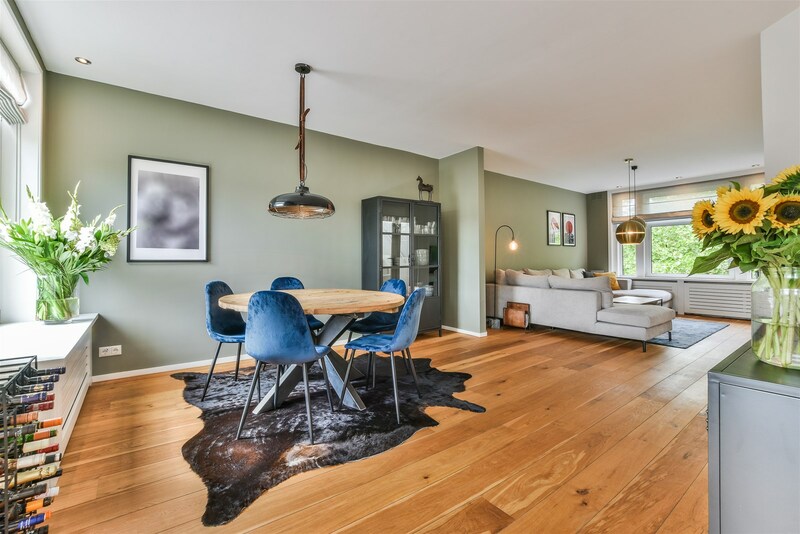 The apartment is situated in a peaceful neighbourhood in Amsterdam West, popular for its central location just on the boundary between Oud-West and Oud-Zuid. This provides a combination of the best of both worlds – in just five minutes, you can cycle to Vondelpark or the popular cafés and restaurants in Amstelveenseweg. Thanks to its location alongside a playground with rows of trees, the apartment is remarkably private and light. Nearby, you will also find numerous stores, supermarkets, cafés and restaurants, including Bar Kosta, Edel and Bartack. For rest and relaxation, Vondelpark and Rembrandtpark, the David Lloyd gym and De Hallen with its cinema and various food & beverage outlets are just a few moments’ cycle ride away. There is also good public transport access, with several trams and buses stopping just around the corner. It is ideal for car users as the A10 motorway is a few minutes’ drive away. On-street parking is readily available and there is currently no waiting list for a parking permit. The recently-renovated staircase leads to your own entrance on the second floor. Hallway and stairs to the third floor. Spacious landing, separate toilet with wash basin, sliding doors to the full-length double-aspect living room. The front has a view of a green square and there is a separate adjoining room featuring a large bespoke built-in wardrobe. This is perfect for use as a study or guest room. 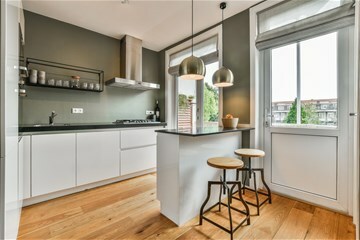 At the rear is the modern, handle-free open kitchen, with built-in equipment, including a refrigerator, freezer, oven, dishwasher, combi-microwave and five-ring gas hob. The kitchen has a corner layout and also features a bar. The kitchen leads onto the balcony, facing due south. The central heating boiler (Nefit, 2018) is also tucked away in a cabinet here. A fixed staircase leads to the fourth floor. Landing, large bedroom with two large bespoke built-in wardrobes. This bedroom can easily be divided into two bedrooms. The luxury bathroom was recently renovated in polished concrete, with a bath, toilet (both Villeroy & Boch), walk-in shower and double wash basin. The landing also has a door leading to the spacious south-facing roof terrace. The roof terrace is equipped with electricity and attractive lighting. This area has the potential to be built on and given a roof terrace and further roof extension. The entire apartment is beautifully plastered and painted and has an attractive wooden floor. - Planning permission has already been granted to add extra space to the apartment. The fourth floor can be extended at the rear and a roof extension with terrace built on the fifth floor. This would increase the apartment size 19 m2. - The homeowners’ association has already given its approval. 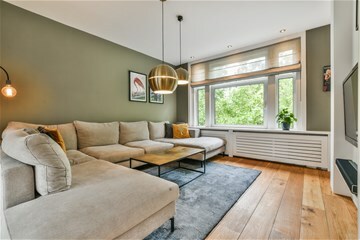 - The apartment is located on long-lease land owned by the City of Amsterdam. - Currently, the lease runs until 15 September 2053. 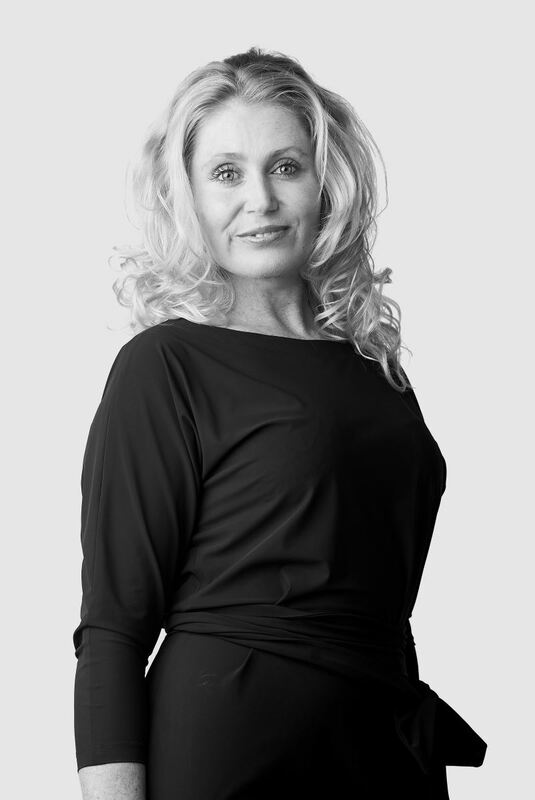 - The active homeowners’ association consists of three apartment owners and is managed professionally by Key & Stefels. - The service costs are €75 a month. - Current surface area 88 m2, with the possibility to extend to 107 m2 (NEN 2580 measurement report available). - Attractive roof terrace covering 18 m2. - The apartment was renovated to a luxury standard in 2016/2017/2018. - Nefit Proline central heating boiler, built in 2018.